Before selling or disposing of an old computer or hard drives, you'll want to make sure personal and business information is really removed from them first. Completely erasing a hard drive isn't as easy as just asking your computer to delete a file or reformat the drive. To safely sanitize your drive, you need to write over it completely. If you don't, there are numerous ways someone could easily recover sensitive data on your hard drive that you thought was safely erased. The CRUÂ WiebeTechÂ Drive eRazerTM Ultra doesn't need another computer to fully erase a drive. It's a stand-alone device that will completely and quickly clean your drive. Just connect it to the Drive eRazer Ultra and it will sanitize the drive faster than using software. 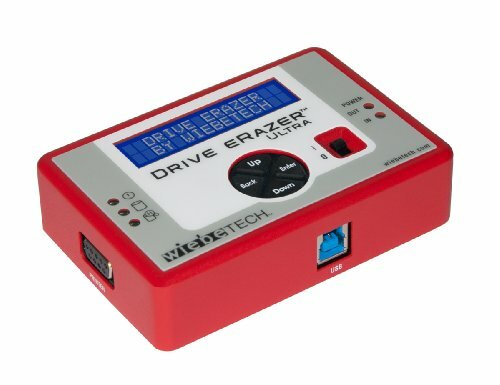 The Drive eRazer Ultra leaves the drive ready for re-use, and comes with more than ten preset erase procedures, including US Department of Defense graded methods for data wiping.